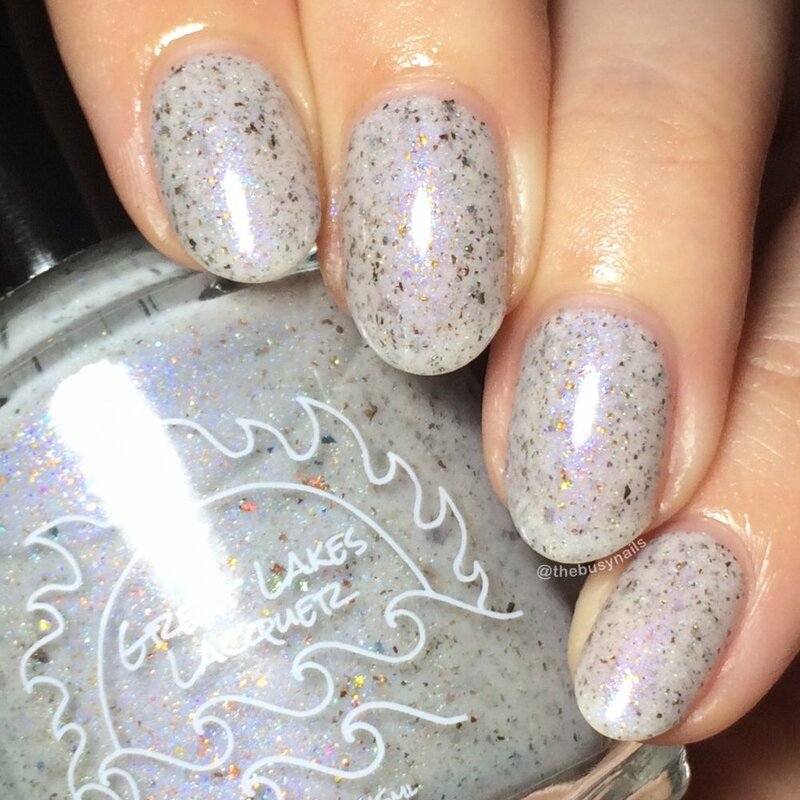 Great Lakes Lacquer has created the most wonderful, ethereal polish for November's Polish Pickup. It's inspired by Lord of the Rings and you might want to order a backup. Or two. 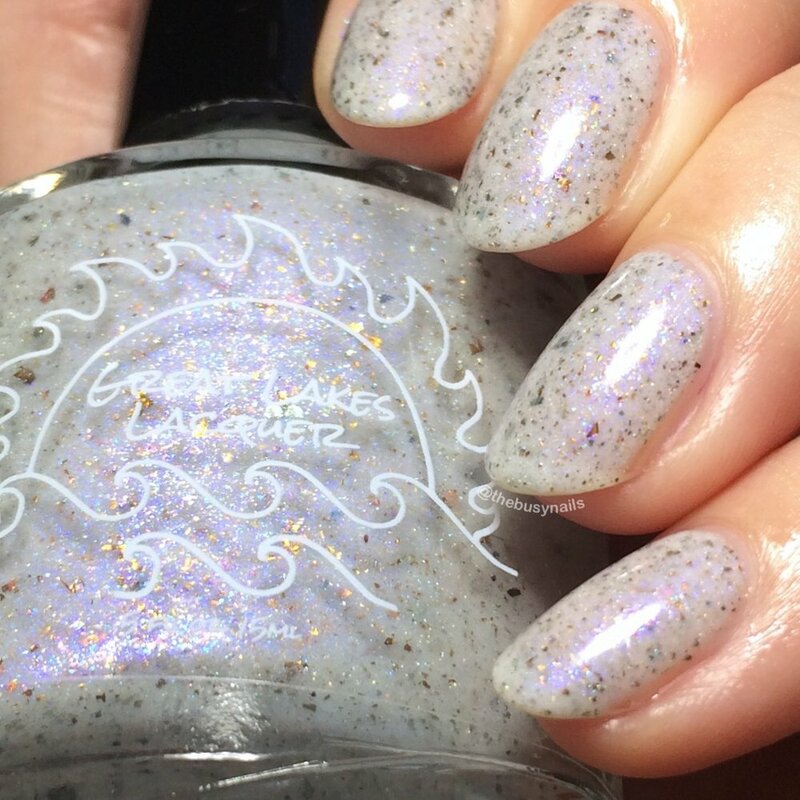 HOW TO BUY: You can purchase this and polishes from other makers on the Polish Pickup website starting Nov. 3rd at 11 AM EST thru Nov. 6th at midnight EST. All photos in this post are taken under artificial light. All shiny swatches are topped with Glisten & Glow HK Girl topcoat and matte swatches are topped with Nina Ultra Pro matte topcoat. This polish was provided for my honest review. Formula: GLL tends to kill it with formula, and even this white crelly is no exception. No issues to report. I did ZERO cleanup for these photos! It goes right where you want it and the flakies distribute evenly. Coverage: I was very happy with the coverage I got in three coats. Although you'll see I still had some slight VNL, I personally think a polish like this looks best when it's not fully opaque. I also tend to max out at three coats, but when I wear this as a full mani, I'll still only use three and be perfectly happy. Overall impression: You guys... I'm in love. This polish is so lovely and delicate. I already love speckled polishes, but the added shimmer really makes this stand out. It also looks absolutely beautiful with matte topcoat. I took A LOT of photos of this baby, so please enjoy.